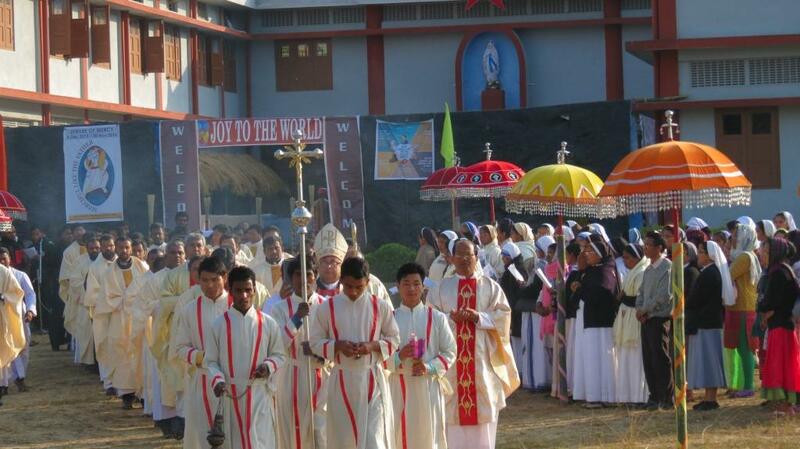 Participating in the Extraordinary Jubilee of Mercy, the Diocese of Miao, situated in the northeastern most corner of India, bordering Myanmar, inaugurated the Door of Mercy at the Christ the Light Shrine in Miao on 17 December 2015. The Diocese of Miao wants this great event of the Church to be truly an event of renewal and grace in the Diocese. Accordingly, a Door of Mercy was solemnly opened at Christ the Light Shrine in Miao by Bishop George Pallipparambil of Miao Diocese. “Any one who enters through this “Door” in prayers and contrition will experience inner healing and and God’s Mercy”, he told the people gathered for the event. There was an introduction to the Jubilee of Mercy prior to the opening of the Door of Mercy. “Mercy is not an abstract term for us. Mercy is a PERSON. Jesus Christ is the human face of God’s mercy for us. Jesus of Nazareth is God’s Mercy in Person. He is the door to God’s Mercy and therefore the Door of Mercy symbolizes Jesus Christ, the door to God’s Mercy”, said Fr. Felix introducing the Extraordinary Jubilee of Mercy to the Priests and Religious and the laity gathered for the event. The Diocesan council also has declared two other Churches in the Diocese to be places of Pilgrimage to win God’s Mercy during the time of Mercy. The first Church in East Arunachal Pradesh, Mary Help of Christians Church in Borduria is one and St. Peter’s Church in Tezu, a place that relates to the death of Servants of God Krick and Bourry, being the other. Every districts in the Diocese has planned to celebrate the Jubilee of Mercy with animation, pilgrimage, confessions, and other corporal and spiritual works of Charity.